* This speaker is ideally suited to applications where the program material exhibits subtlety and nuance. Perfectly capable of reproducing high fidelity full range sound without a subwoofer, when coupled with extended low frequencies of the PRX618S-XLF, one experiences complete control over the entire audio spectrum. These cabinets can be stand-mounted but do require a large footprint tri-pod type stand. When pole mounting the PRX635 on a subwoofer we highly recommend a pole no longer than 24� (SS3BK-24 or SS4BK-24) to ensure stability and safety. As with all the full-range PRX600 Series systems two EQ selections can be used to optimize the system for the program material and/or environment. The input section also accommodates either Line or Mic/Instrument level inputs. 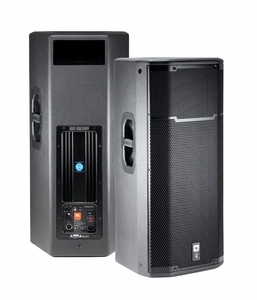 * The PRX635 is a self-powered, lightweight three-way loudspeaker system capable of delivering a very high level of performance over a broad bandwidth. The PRX635 is comprised of one 380 mm (15 in) 265F Differential Drive� woofer, a 165 mm (6.5 in) 195H horn-loaded 90� by 50� mid-range and a 2414H 25.4 mm (1 in) annular polymer diaphragm, neodymium compression driver mounted to a 90� by 50� horn, all driven by a 1500 watt (3 x 500) Audio Class-D power amplifier. A propriety DSP chip is at the core of a fully featured input section, providing user selectable system EQ, protection, input sensitivity selection, cross-over functionality, dynamic limiting and discrete component optimization. * The amplifier input panel offers XLR or � inch jack compatibility and a sensitivity switch provides extra flexibility, making it possible to connect literally any sound source without using a mixer. Signal present and overload lights indicate the system status and assist in setting the optimum level, via the level control knob. * All PRX600 cabinets are built from a combination of 25mm (on the top and bottom for added rigidity) and 18mm, strong, light-weight poplar plywood made structurally sound with tongue and groove joints. All PRX600 Series cabinets are protected by JBL�s tour proven DuraFlex� finish. Grilles are made from dent-resistant 16 gauge steel and handles are made from light-weight glass-filled nylon for added strength and durability. All M10 suspension points are constructed from 14 gauge steel and have been tested with a yield-strength of 1000 lbs. each.